How can I repair tears in sheets & bed linen? | How can I recycle this? How can I repair tears in sheets & bed linen? When we moved into our new house last autumn, we got a new bed. Despite our love of slumber, our last bed was awful – the cheapest double I could find when I needed a bed in a hurry back in 2002. It was small, uncomfortable and had been repaired so many times, I think by the end it was made out entirely of glue and hope, not badly laminated wood. When we moved here, we decided to do things right – after looking at the options in all the big bed shops and online, we ended up commissioning a local furniture maker to make us a bed frame instead*. He made it out of reclaimed wood (yay recycling!) and to a chunky design of our choosing. When he came to assemble it, he gave us a little tool which we might have to use to tighten some bolts — in twenty years time. It’s the best, most solid bed I’ve ever met and we’re very happy with it. Why am I telling this story in a post about sheets & bed linen? Well, because we decided that after getting the bed frame right, we were going to get the rest of our bed experience spot on too. Like with the bed itself, we decided to buy good quality items that would last us for years and years, instead of cheap things that would fall apart – a key part of “reducing”. I spent ages tracking down & more money than I would normally do on bed linen to get top quality 100% cotton duvet covers. And you know what? Both have ripped already. We think one of them got ripped on our cat Carbon’s last day – sadly, I can imagine him using the duvet to claw his way onto the bed, or using his claws to drag himself around the space once he was up there. There is a straight tear in it about four inches long, and some smaller tears & L-shaped tears in other spots too. The other duvet cover? I’ve no idea how that got ripped. I just found an L-shaped tear in it – about four inches on either side – when I was washing it the other day. Whatever happened though, it needs fixing. So what is the best way to repair these supposed-to-last-years duvet covers? Will something like iron-on mending tape work? Or would good old-fashioned sewing be better – and if so, any stitch/method recommendations? Or would patching them be a better route in the long run? Any advice on doing that neatly and smoothly? * In case anyone’s interested, it was Stump Furniture in Leeds. It wasn’t exactly cheap but it was the same price as the one we were looking at in a brand-name bed shop — and that brand-name bed was allegedly half the price it should have been. I doubt that shop one would have been so well made. Old fashioned sewing is the best! 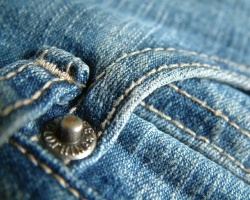 – patch with matching or different fabric on top of tear. Make sure the sheet fabric is stitched together, so that the tear area can’t tear any bigger. After years of use and dozens of washes, a small tear can grow. If you are worried that the sewing of the ripped part would look odd, add the patch on top of the fabric, so you can only see that. Also this technique for patching jeans would probably look attractive http://blog.craftzine.com/archive/2009/03/how-to_patching_pants_with_sty.html I would probably use this method myself. This is definitely the strongest bind for the fabrics. Just find some fabric of the same thickness or a bit thinner, same material (cotton usually), and of a color that looks nice with it, if it’s not the same color, and then with some thread that matches or complements it. You could even use some fancy threads to add some nice touch. I’m with Anna on the sewing. Iron-on patches and tapes will not hold up to the kind of laundering bed linens get! However, I usually repair with darning. It can be done by hand or machine; it’s basically rows of running stitch parallel and perpendicular to the tear. http://www.shojistyles.com/crafts/aag-table-linen.htm describes the process in more detail. I have repaired more linens than I care to count! If you use the regular iron on patches, they tend to be stiff. First I would treat each side of the tear with a bit of a compound that is designed to keep seams from fraying. I don’t know the trade name, but you can find it in most fabric centers. Then I would use the darning method mentioned above, but with a light hand. Don’t try to fill in the entire space with thread, but use enough to make a strong bond. Then I would applique a contrasting design over the top of the mend. and I would look for other places where I might put a similar applique or two so that it looks like you have a custom made duvet cover. May sound like a lot of work, but it could be a creative opportunity as well. If none of that sounds like something you want to do, ask a Grandmother in the neighborhood if she would like to darn it for you! I have many antique linens that have mended places, and each spot makes we wonder who might have so carefully cared for the linen before it came to me. I have found that *linen* linen are best. I got several sheets after my hubby’s great grandmother that are still in tip top shape despite being about 100 years old, whereas the cotton sheets we’ve received as gifts over the years are all torn – even the fancy expensive quality ones. After fixing the first two or three tears, mine always seem to get bunches of tears at once all of a sudden, and then I give them to the dog instead of fixing them any further. And, how come the tears are almost always L-shaped?! Cipollina’s comment reminds me of the best way to deal with tears in bed linens: pay attention to thread count and weave structure when you buy them! Sure, linen sheets are durable, but it takes years for them to become as soft and comfortable as cotton and they are also weakened by bleach and the agitation of washing machines just as cotton sheets are. A higher thread count often commands a higher price, but uses much thinner (and therefore fragile) threads to make each square inch of the fabric. A firm plain weave keeps the individual threads from wear and tear much better than sateen weave or even a standard twill. 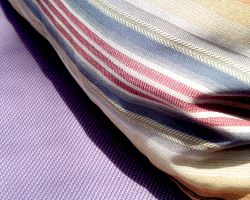 I have noticed that my 800-thread count sateen stripe sheets would snag, then tear, along the boundaries of the stripes where the weave structure changes because the threads are looser there. However, those sheets have lasted for years with only a few repairs! Only one of them has been retired in over five years of use, and most of it is still going as crib sheets and tea towels. Anyway, my mother reminded me of the simplest way to sew up a tear in fabric that hasn’t frayed very much yet. Just lay the fabric so the edges of the tear are together, and use a machine zig-zag stitch across the tear. Hand sewing is usually faster for me than wrestling a fitted sheet or duvet cover onto the machine for a small tear. Depends on your comfort level with hand sewing, I guess. This is the common problem that usually happens. I would like to suggest the sewing is the cheap and best method to fix this problem. But you assign this work to a person who is good hand in stiching. Zigzag stitch works best. You need to add a strip of reinforce material underneath. If you have a modern sewing machine, why not try one of the embroidery stitches across the rip. Though it may produce a slight lumpiness. My dog has just ripped a large L shaped tear in my beautiful new Sanderson duvet cover. I don’t have a sewing machine and have been wondering what would be the best way of trying to repair it. Another idea for those who can’t or don’t sew, is to have the linen darned at your local dry-cleaner or tailoring shop. Some of them are very talented and always have a sewer as one of their ‘contractor’ resources. I’ve had many pieces darned from mine and am always amazed at how well they do…for a surprisingly nominal price. After noticing thinning fabric and some shredding on a fitted sheet, I almost trashed it, but a new fitted sheet is expensive and wouldn’t match the flat sheet and pillow cases anyway. I took a large piece of fabric that matched pretty well and ironed the edges under, then pinned in place over the damaged area. After machine stitching on the topside of the sheet, I cut out the damaged sheet fabric on the bottom side making the hole smaller than outside edges of the patch and stitched that. It took about an hour, really turned out well, and saved the whole king sheet set. I’m thrilled. I did order a new set, tho, and will now have 3 to rotate. and your article has made us all to save the money. Your opinions really responded all our concerns. In fact, greater than what we had recognized before we found your fantastic blog. I don’t know anything about this sort of thing but my new lab puppy decided to have a field day on my brand new expensive sheets and ripped a few tears here and there (and on 3 sets of sheets though). So DIY definitely isn’t an option for me as I would have no idea what I’m doing. so I was going to take them to a seamstress. Here’s my question. It seems like I’ve heard or just experienced myself that tears or wholes in fabric get worse after washing them, but maybe it’s in my head. Would you recommend not washing/drying the sheets prior to taking to seamstress? Thanks! I would personally just go to a fabric store and get some iron on webbing or patches to close the holes. And iron it on the inside where you won’t see it.